The other day, Lloyd McClendon got himself ejected from a spring-training game when he argued with an umpire. Following some earlier events, Bruce Chen threw consecutive pitches behind Rickie Weeks, and after the second one, the umpire issued warnings to both dugouts. McClendon took exception to this, figuring a warning should’ve come a pitch earlier. So then, after the second pitch, Chen should’ve been thrown out, and McClendon didn’t like that he wasn’t. After voicing his displeasure, McClendon walked 400 feet to leave the field, which might’ve given him enough time to remember that it’s March, and if anything, you might want your team to have more at-bats against Bruce Chen in the Arizona sunshine. It’s all kind of silly, on account of how the games don’t mean a single thing. It seems ridiculous for a manager to get ejected arguing that an opposing player should’ve been ejected, in March. The stakes just aren’t there to justify the emotional response. But on some level, you can see how perhaps a manager wants to be able to defend his own player. Good for the trust. And to some degree, managers just can’t help being managers, no matter the setting. Being a baseball manager is something you can’t fully turn off, and this all brings me to the point that there are intentional walks in spring-training games. Maybe that’s something you already knew. Maybe that’s something you didn’t know, but would’ve guessed. Probably, it’s something you’ve never really noticed, given that intentional walks tend to come later in games, and no one watches the last few innings of anything this time of year. To be honest, odds are you’ve never really thought much about whether there are intentional walks prior to Opening Day. But it’s something that occurs to me every spring, because it’s silly, even if it’s not totally inexplicable. How many intentional walks have there been? Some. 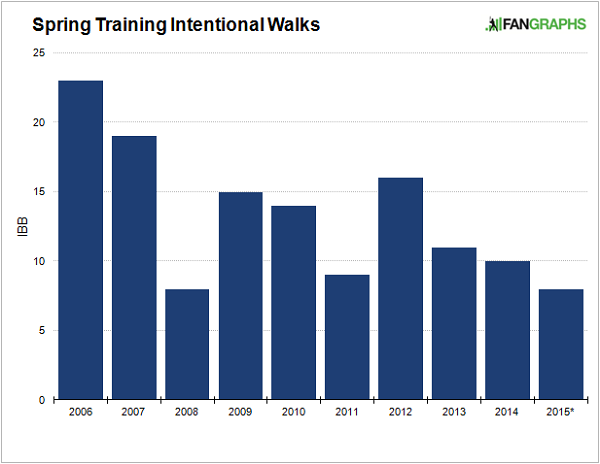 There have been some intentional walks, in spring training, over the course of the past 10 years. So far this year, there have been eight. Eight is not very many, but eight is eight more than none, which seems the ideal. If you’re looking for a glimmer of optimism — if optimism can even apply to this in any way — the highest observed total was in 2006. The second-highest observed total was in 2007. Maybe that’s a trend. 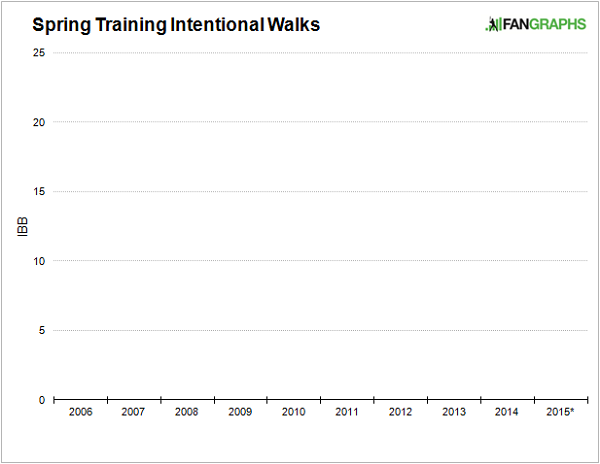 But then, in 2012, there were twice as many spring-training intentional walks as there were in 2008. This is a thing that most definitely happens. I don’t know if it always has, but all we really care about is the present and the most recent of the past. Thing is, these are all normal intentional-walk situations. Of course they are. While I didn’t list anything about pitcher or batter handedness, the handednesses were what you’d expect. Take Randy Choate, for example. The lefty specialist walked the righty David Wright with a base open so he could face the lefty Lucas Duda. That’s absolutely what you’d expect in a baseball game. But, that’s what you’d expect in a baseball game that matters. Why a few days ago? Choate’s already faced Duda five times in his career. Also, he’s Randy Choate. You kind of know what you’re getting. Choate has actually pitched to Wright once, ever. Maybe you could learn something from letting that play out. Even if Wright reaches base, Choate still faces Duda, and it’s not like runs would matter. Really, I do get it, kind of. Spring training is about practice, and you want the players to practice in situations they’ll face when things count. Choate will throw meaningful pitches to lefties like Duda. He won’t throw many meaningful pitches to righties like Wright. All these situations mirrored potential regular-season in-game situations, and managers want to see how pitchers respond. Fine! What I don’t get is why the numbers are so low. I don’t quite get the half-measures, or the, I don’t know, one-tenth-measures. Last year, around baseball, the fewest intentional walks issued in any month was 156. In spring training, there were 10. So, in almost all intentional-walk situations in the spring, managers let pitchers just pitch. It was only some of the time, rarely, that the catcher was told to stand up. Yeah, there are more arms at your disposal in spring. It’s easier to shuffle through relievers. But, take that Matt Belisle intentional walk. In the eighth inning of a close game, he walked a lefty to face a righty with the bases loaded. The very next inning, Jordan Walden pitched out of the same bullpen. The game was still close. With runners on second and third and a righty on deck, he didn’t issue an intentional walk. Walden pitched through it, with the same manager as Belisle, and, I don’t know. I’m sure there was a reason. There’s always some kind of reason. These spring-training intentional walks — they’re not stupid. Managers don’t do things that are obviously stupid. To some degree, every single one makes sense. But the infrequency also demonstrates that managers usually don’t give a damn, which makes it curious that, sometimes, they do. It might be no more than the fact that managers can’t stop managing. You can’t help what you are. You can’t help but treat Randy Choate the way you’ve always treated Randy Choate. Who’s really going to notice, anyway? Besides me, I guess, but it’s not like I’m actually watching these games. We hoped you liked reading There are Intentional Walks in Spring Training by Jeff Sullivan! Are Swinging Strikes Better Than Called Strikes? It’s like you knew how much we missed you, and decided to immediately get back to peak Jeff instead of ramping up gradually. I don’t see any GIFs. Is my internet broken? You need to go back and watch that first graph for a bit. It does animate, eventually. It takes awhile, but it’s totally worth it.